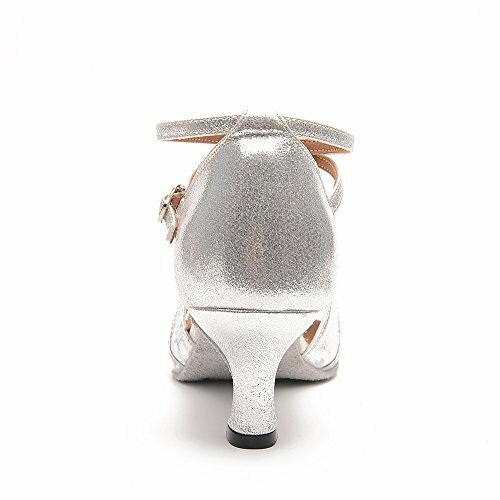 Superpark is committed to producing high quality and economic dance shoes for pretty ladies, you can wear them to any party, prom, evening or wedding Occasions, and you will be the Princess of all audience. This kind of women Latin dance shoes can be used both in the ballroom indoor and outdoor (you can choose shoes sole according to your need). The indoor shoes sole is made of cow suede, which is soft, comfortable and durable. The outdoor shoes sole is made of high quality rubber, which is lightweight and comfortable. We take all pictures from the real shoes, there may be a little different due to different displays, shooting light, environmental factors or other reasons, if you have any problems about size, quality, or other questions, welcome to contact us at any time, we have professionals to answer them timely. How do I buckle these shoes? 1st – the buckle is already on the strap, so simply find the right strap’s hole (i.e. lenght you need to fasten the shoe) for your foot. And be aware that it may vary from left to right foot. 2nd – next pull the strap a bit (so the buckle goes a little past the closing position) and make the strap slide through the opening on the hook (the fixed part) and pull. 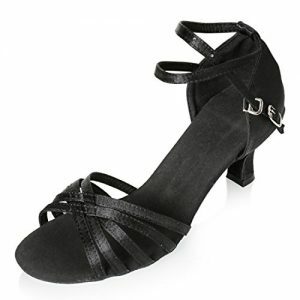 If the strap feels loose adjust it; dance shoes are supposed to be tightly fastened. To open, pull the strap make it slide out of the hook and you’re done.